1. They HAVE BEEN in Chicago for 20 years (be). 6. Unfortunately, just as we got to the airport their plane TOOK off (take). 8. I was tired yesterday because I HADN’T SLEPT well the night before (not sleep). 9. Sh! Someone IS LISTENING to our conversation (listen)! 14. I AM NOT WEARING my watch because it is being fixed (not wear). 15. This IS an easy quiz so far (be). 16. They ARE LIVING in an apartment right now because they can’t find a cheap house. 19. I was angry that I HAD MADE such a stupid mistake (make). 22. Our daughter HASN’T GRADUATED from the university yet (gradate). 26. Nothing much HAD HAPPENED when I got to the meeting (happen). 27. My parents WILL BE in New York two weeks from today (be). You can work in pairs, with the person sitting next to you. Create a post in your blog with the rubrics in this post and the slideshare with the questions. Answer the questions in your blog. If you do not have access to a computer, you may start answering your questions on paper. The final product, i.e. your answers, must be in a post in your blog. To discourage agression from any nation, to encourage countries to co-operate especially in business and trade and to disarm and to improve the living and working conditions of people in all parts of the world. There was an election but Wilson wasn’t re-elected and the new government did not approve of the League. Because they had never approved of the USA joining the war against Germany so they did not want USA to sign the Treaty as it squeezed reparations payments out of Germany. That people thought that it would be as if they signed a blank cheque. That they thought that the USA had become a powerful country by being isolated, by staying out of European affairs. 6. Because the population was largely Polish. The League didn’t act about it because, at first, they protested to Poland but she didn’t withdraw, then they sent French and British troops to force the Poles out of Vilna but they did not and they didn’t insist because Poland could become a future German ally. 7. Because it was an important industrial región because of its rich iron and steal industry. 8.They didn’t solve it, Poland just kept Vilna. 9. 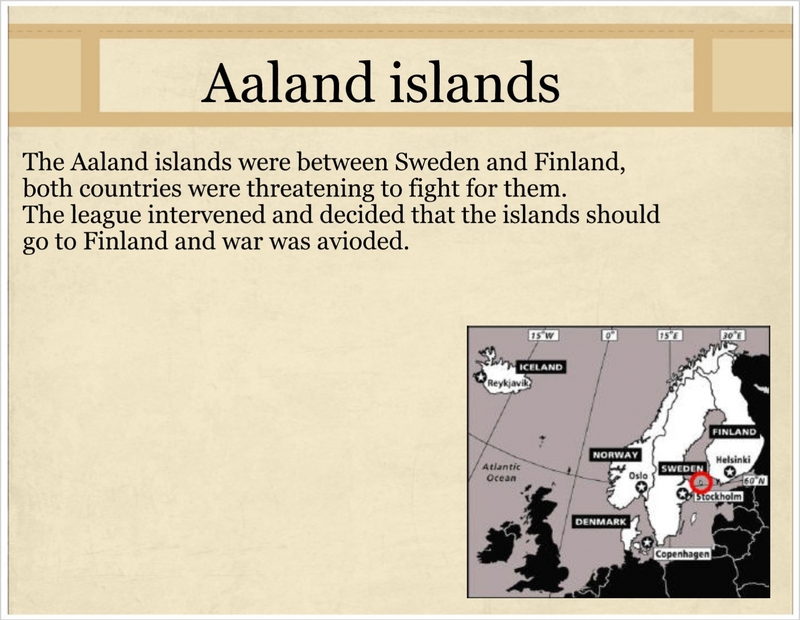 That Finland should keep them. 12. Because before it was signed there was a general election in Britain and the new government refused to sign the Protocol worried that Britain would be forced to agree to something that wasn’t in her interests. 13. Because some Greek soldiers were killed on the border. Our teacher Lenny asked us to do 2 infographics. 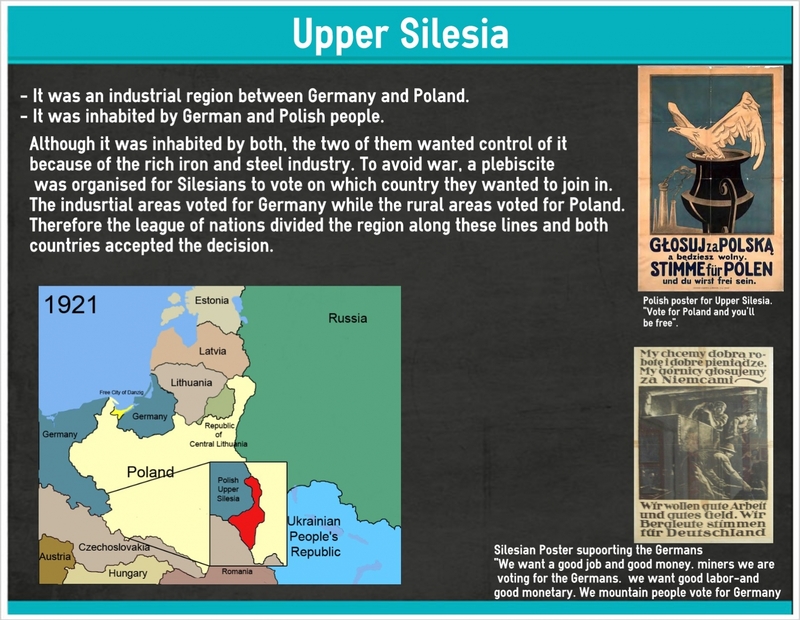 One about the conflict for Upper Silesia and another one for the conflict for the Aaland Islands. Ya que leímos el libro, Dr.Jekyll y Mr.Hyde, un cuento sobre un científico que separa sus ‘dos personalidades’; nuestra maestra Carol nos dijo que escribamos un texto de 200-250 palabras sobre si estamos de acuredo o no con la frase: “todos tenemos dos personalidades”. En mi opinión todos tenemos dos personalidades, una buena y una mal. En general, la buena predomina pero todo depende del estado de ánimo en el que uno está o por la etapa de vida por la que uno está pasando. Por un lado, tenemos características ‘buenas’ que forman la ‘buena’ personalidad o, mejor personalidad. Ya que es preferible ser amable y generoso que egoísta y amargado. Estos rasgos se muestran dependiendo de la situación en la que uno está. Por ejemplo, si te encontrás con una persona que no veías hace mucho tiempo, probablemente estés muy alegre y cariñoso. Sin embargo, por muy estable que sea una persona, siempre, en algún momento, hay algo que hace aparecer la ‘otra parte’ de esta. Por el otro lado, existe la otra personalidad, la que noes tan buena, la que es ‘mala’. Ya que las características que la conforman son negativas, como ser agresivo, pesimista, egocéntrico, entre otras. Por ejemplo, si te sacaste una mala nota en una examen te podes poner de mal humor y violento. De todas formas, esta ‘fase’ no se refleja tan a menudo como la anterior, pero todos la tenemos. En conclusión, todos tenemos dos personalidades que se reflejan dependiendo de lo que esté pasando a nuestro alrededor. Aunque la buena es la que, generalmente, más mostramos, todos tenemos una mala también.